So when I started this blog, I was wondering how often I would be posting new entries. Come to find out, I am old and rather boring so it does take awhile to have enough interesting information to discuss. Just to give you an idea of my level of boringness at this time in my life, sleeping until 4:30 a.m., without interruption, has been one of the most exciting developments of this last month!Speaking of being old and boring, can you believe how busy life gets when the responsibilities of being old and boring start stacking up? I remember being SO busy in college, maybe you can relate. I ran cross-country in college so there were classes, homework, and running. Otherwise, there was a lot of goofing around and beer drinking (off season and after age 21, of course), but it did seem SO busy. Then there was law school. There was studying and more studying…SO, SO busy. Then I had to get a job and work for a living. Working all day, grocery shopping, cooking and cleaning, now that was SUCH a busy time. Then came the house. Home ownership, working, shopping, cooking and cleaning…can you say SO, SO, SO busy. Then came the dog. And you can’t really have one dog if you’re gone all day. Thus, dog number two which made life SO, SO, SO, SO busy. And then came Maddux. As my dad says, he’s a “time burner”. A very cute time burner, that is. So how in the world am I getting more workouts in now than I did when I was SO, SO, SO, SO busy (yes, that would be the job, the house, the chores and the dogs)? Because, on average I would say I missed one workout a week back then. The Boss Man says it comes down to prioritizing. Anyone can take on a fitness goal and training if they want to. As crazy as Boss Man sounds, it seems to be TRUE!!! I believe I became my own drill sergeant, to a point. I now have one girls’ night a week, not three. I also have workouts planned every lunch hour, which means that I am up packing a lunch every morning. There’s no more deciding I’m hungry at 11:30 and going to lunch with co-workers and saving the run for after work (because there’s not a whole lot of energy for after work runs, to be honest, especially when you want to meet up with your girlfriends). When I have negotiated with my husband and obtained the right to the coveted Saturday morning free time, the choice to drink some coffee and wait until I really feel like running is not there. I either go or lose my time! Isn’t it so much easier to have no choice in the matter? The Boss Man does play an important part, I must say. I tell the Boss Man I’m in court all day on Wednesday. So, my rest day is Wednesday. I say I have a one-hour break on Monday in the middle of the day and typically 40 minutes of free workout time later that night. The boss man plugs in workouts and makes it work. What a relief not to have to think about it when the level of business of my schedule seems so high (which seems ironic when the boringness level is equally as high). 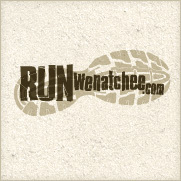 Lake Chelan Shore to Shore Marathon, Relay, Half and 10k Sept 10th, 2011, presented by North Cascades National Bank and Lake Chelan Chamber of Commerce!